Today started off as not so great. Missed the train to Stockholm at 10.09 I was going to take (Yes, I stod behind the freaking lattice barrier and saw the train leaving.) So then I decided to take the local train - guess it wasn't meant to be, since the door closed and the train left as I walked up to it. Awsome. So THEN I decid to take the bus, which would leave at 10.30. I ran to the stor eto buy a ticket and then back. Waiting. Waiting some more. Realize the bus at 10.30 doesn't run on tuesdays!!! So I had to wait until 11... What a great start!!!! After having a few emotional breakdowns I finally get on the bus and on to Stockholm, fix my errands, meet up with my bundis and the back to Uppsala and work. I got three new students today, which I'm very excited about!! After work my sister comes home with me, and I help her making highlights. We had so much fun!!!! haha youre the best! thats for helping me with my hair. 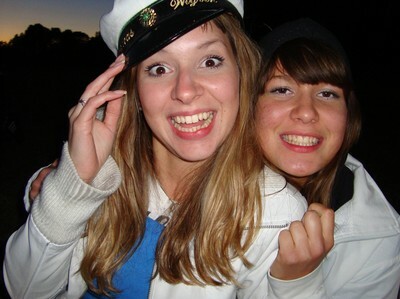 Haha I have never seen that pic, funny smile I got :p Love you! !